Like most of California, Sacramento is a place with weather that's comfortable all year long. For sunny days and clear skies, it's best between late spring and early fall. From November through February, the Sacramento area is subject to dense Tule fog (rhymes with "Julie"). It occurs before sunrise when the ground is wet from rain, the sky is cloudless, and there's no wind. Thank goodness that perfect storm of conditions don't often happen because it can be deadly. Tule fog can be so thick that you can't see the hood of your car from the driver's seat and visibility can drop from poor to zero in an instant. Even worse, if the temperature is cold enough, black ice forms on the highways. Chain-reaction accidents are frequent and can involve scores of vehicles, with dozens of injuries and fatalities. If you're in Sacramento on a cold, wet, windless morning, check current highway conditions before getting out on the road and if you can, stay put until it clears up. If you're looking for moderate temperatures and little chance of rain, spring is the perfect time to visit Sacramento. What to Pack: After winter rains end in March, you can get out those cute spring outfits and visit Sacramento looking stylish. You'll need to complement that outfit with an extra layer for evenings after the sun goes down. Sacramento's summer weather is almost boringly consistent. Expect it to be hot, but rain is unlikely. By Sacramento standards, summer is the most humid season, but it rarely exceeds 30 percent. Even the hottest days cool off in the evening, and it's the perfect time to enjoy boat rides and water sports on the river. According to the data-analyzing geeks at Weatherspark who calculate tourism scores based on weather, the best time of year to visit Sacramento for outdoor activities is from mid-June to late September, with a peak score in the first week of August. What to Pack: Pack for hot days and cool evenings. Average highs may be in the 90s but expect some days to top 100 degrees Fahrenheit. Women can choose cute summer dresses that would look good with tights that they can slip on to keep the legs warm when the air is chilly. A light sweater might also feel good after dark. During summer mosquito season, take insect repellent or cover up. Sunscreen is also a must. 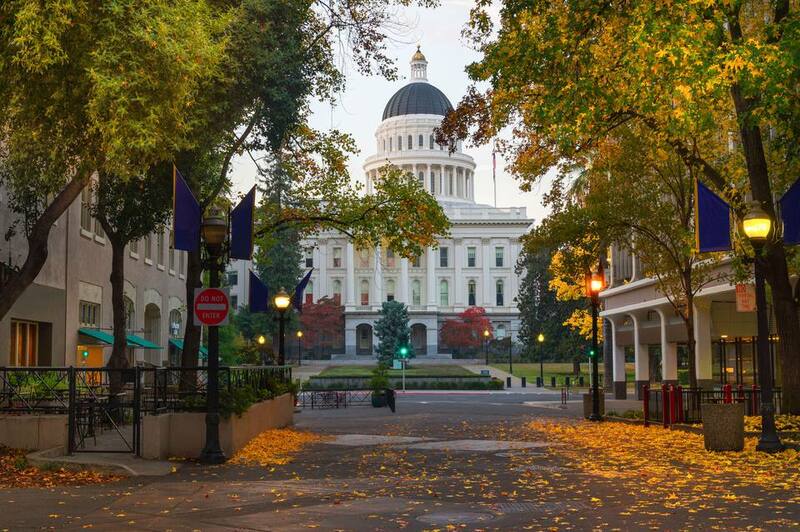 You can easily fall in love with Sacramento in autumn, especially during the short time between the busy summer season and the onset of winter rains. Fall can also be beautiful along streets in the City of Trees as the leaves change colors. Winter is California's rainy season, but averages can't tell the whole story. In some years, barely a drop of rain falls all winter long. In others, especially the so-called "El Nino" years, multiple winter storms drench the entire state and its inhabitants. When it rains, Sacramento's location at the confluence of the American and Sacramento Rivers makes it prone to floods. In fact, in 1862, newly elected Governor Leland Stanford had to travel to his inauguration in a rowboat. Today's levees make that unlikely to happen again. However, flooding is still a possibility when torrential rains and king tides combine to push the rivers out of their banks. What to Pack: When planning months ahead, put rain gear on your packing list, but re-check the short-range forecast before your trip; you may not need it. When planning for rain, think downpour not drizzle. If you plan to spend your winter days exploring the top things to do in Sacramento they may include outdoor and indoor activities. Layer up so you can be comfortable indoors and out. You can get a look at Sacramento year-round climate in these graphs. For more data of all kinds, you can get lost for hours looking at the weather trends at Weather Spark.